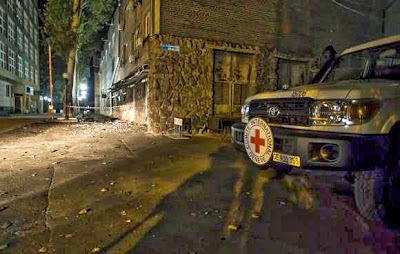 DONETSK, Ukraine -- A Swiss Red Cross worker was killed by a shell that landed near the international organization's office in Ukraine's separatist-held city of Donetsk on Thursday. 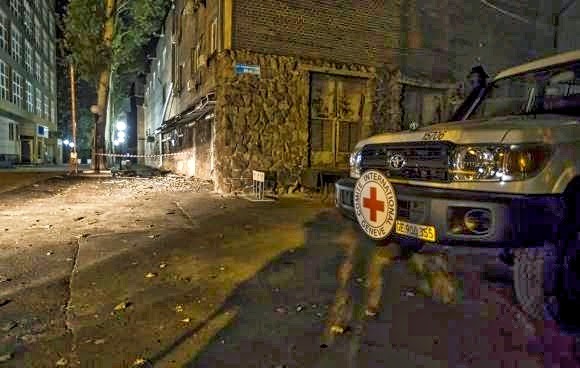 A Red Cross vehicle is parked near the damaged office of the International Committee of the Red Cross in Donetsk, eastern Ukraine, October 2, 2014. Both the pro-Russian separatists and the Ukrainian government forces they have been fighting blamed each other for the attack which smashed windows, scattered shrapnel and left a crater in the pavement. The International Committee of the Red Cross (ICRC), said Laurent DuPasquier, a 38-year-old administrator in its Donetsk office, had been in Ukraine for six weeks before he was hit. "We understand that there were other civilian casualties in Donetsk today. Indiscriminate shelling of residential areas is unacceptable and violates international humanitarian law," ICRC Director of Operations Dominik Stillhart said in a statement. The agency's other staff, including about 20 Ukrainian and international employees based in Donetsk, were "now in safety", the statement said. "We're deeply distressed by this loss," ICRC spokesman Ewan Watson told Reuters. Poroshenko said last week the ceasefire was holding. But it has come increasingly frayed in the past few days with increased fighting going on around the main international airport of Donetsk, from where separatists are trying to dislodge government forces. Ukrainian Foreign Minister Pavel Klimkin blamed the separatists for Thursday's attack. "I have only one question: do the terrorists have any idea of what humanity is all about when they shell the Donetsk office of the ICRC, whose only aim is to help people?" he said.